I'm embarrassed to say that this was my first taste of Terry Pratchett, curiosity tweaked by a swathe of obituaries lamenting his loss. And just one book into an impressive catalogue of work, I can see why the author's fans are so numerous. 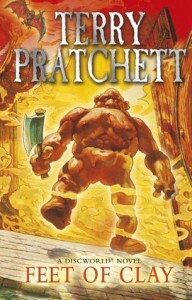 One of the Discworld series, the story centres on the Ankh-Morpork Watch led by Commander Sir Samuel Comes and his diverse team, as they unravel two murders and a lingering threat to the local overlord. Any tale including werewolves, dwarves, vampires and golems is likely to engage, but it is the delightful humour which sets the writing apart. Inventive, bazaar and laugh-out-loud funny, this is simply a wonderful indulgence.